Thirty years ago the University of California Press published an unusual manuscript by an anthropology student named Carlos Castaneda. The Teachings of Don Juan initiated a generation of seekers dissatisfied with the limitations of the Western worldview. Castaneda's now classic book remains controversial for the alternative way of seeing that it presents and the revolution in cognition it demands. In a series of fascinating dialogues, Castaneda sets forth his partial initiation with don Juan Matus, a Yaqui Indian shaman from the state of Sonora, Mexico. He describes don Juan's perception and mastery of the "non-ordinary reality" and how peyote along with other plants sacred to the Mexican Indians were used as gateways to the mysteries of "dread," "clarity," and "power." 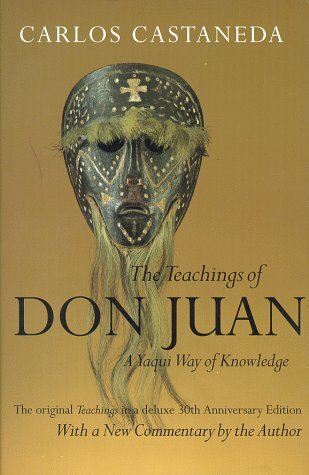 The Teachings of Don Juan is the story of a remarkable journey that has left an indelible impression on the life of more than a million readers around the world.